As we strolled back to the parking garage, I noticed a man in rags parked on the sidewalk looking around as if he were lost. To my young self, it was like seeing a tattered old blanket. Not your blanket, of course. Not the one from childhood that smells the way it did when it brought you unfathomable security. He was like someone else's blanket. One you don't have a connection to and wonder how on earth it got so dirty. I had never seen anyone like this man before, so I stared, thinking perhaps the longer I looked the more I'd understand. Suddenly, the man jutted his arm toward me and mumbled something in an injured tone. I jumped! Did he know me? Was he trying to take me? Did he need help? My grandparents stepped in and anonymously shook their heads at him. I was grateful. They could see I was afraid, and they took control of the situation. As we continued walking, my grandma leaned over and said in a gentle tone, "Just keep your head down. If you don't look at them, they won't talk to you." That singular experience was essentially my philosophy on homelessness for almost 15 years. Don't get me wrong, I still volunteered at food banks; I organized food and clothing drives; I gave money to panhandlers. But even though I worked to treat my fellow beings with compassion, there was still a separation defined by the discomfort of that first encounter. "We're all human, but sometimes it's less scary to keep your head down." I finally recognized that quietly hidden pathology the moment I left it behind. In my 20's, I was cast in a production of the musical Rent. Guess what I played? A homeless person. As an actor, it's not effective to judge your character, so I didn't even think twice about playing the role. On the contrary, I was excited for the challenge. It never even occurred to me that doing so would have real life implications. Then one day I was walking around Los Angeles and saw a woman on the streets. Immediately I thought "Oh, that's me." And that's when I realized my reaction hadn't been "Poor lady." Gone was the separation. As make believe as my acting in a musical was, it had built a bridge that connected me to this woman's experience. We were the same. From that day on, I started looking at everyone suffering from homelessness in the eye...and smiling. 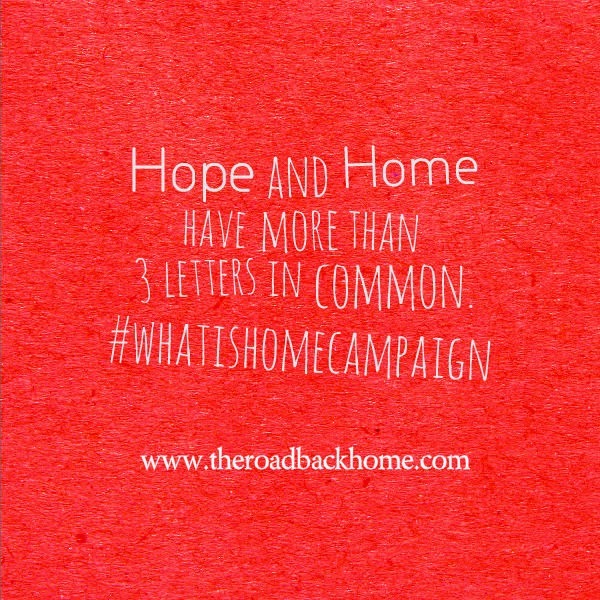 Fast forward to 2014, at which point I was preparing the next update for my charity website www.theroadbackhome.com. Some of you might know that besides bringing awareness to different causes and charitable organizations, we encourage the idea that everyone deserves to feel "at home" in their lives. Well obviously with a mission statement like that, I knew at some point we'd have to tackle homelessness, but figuring out how to approach the issue on a public platform had always been intimidating. Having no real answers as to how to proceed, this year I started talking to other people. As often as I could, I brought up homelessness in conversations to hear what others had to say. And in this very unscientific social experiment, I found that 9 out of 10 people I spoke with began their side of the conversation with doubt. Despite my empathy toward the discomfort of this issue, I was still very surprised by these findings. 9 out of 10 means the public roughly perceives 90% of the homeless population to be either completely hopeless or simply outside their social responsibilities. 90%?! That's impossible, and quite frankly, a little bit silly. This caused me to once again look at my own views on homelessness and wonder, "How did we become so skewed? I'm going to be brutally honest here. In our philanthropic efforts, it's a lot easier to surround ourselves with causes that lend themselves to beauty: the smile of a sick child, the beautification of a city park, the education of our youth. But there's very little beauty in homelessness. It's one of the few nightmares in life that actually looks as bad as it feels. And that's when it hit me. We're not all skewed, horrible people. We just want to feel better about a very ugly problem! That's why many of us convince ourselves homeless people somehow deserve their circumstances. That's why many of us selflessly give money to people on the side of the freeway exit. Unfortunately, neither of these things do anything to solve the real problem. That's why I started the #whatishomecampaign. It was time to take a different look at how we define "home," and subsequently "homeless"
Homeless people are on Facebook. Think you don't know somebody that's dealt with homelessness? Think again. How about somebody that's moved in with family members because it was their only choice? Transitional Homelessness makes up the biggest percentage of the homeless population, while "skid row" or Chronic Homelessness makes up the smallest. Homelessness is beautiful. Sounds strange, I know, but we must find the beauty in things we truly want to change. Otherwise, the change we make is usually superficial, and only makes us feel better temporarily. The truth is Hope is found in Homelessness, therefore it's beautiful. 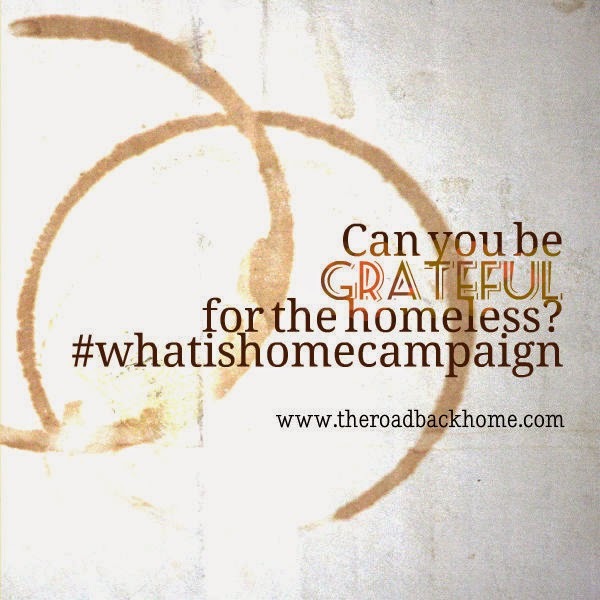 This year I'm grateful for the homeless. It's a journey that started a long time ago, and I'm proud to say I'm leaving 2014 with more than just a new perspective. In many ways I feel free. I'm at peace with the discomfort I've perpetually tried to soothe since childhood. I welcome 2015 with a full tank of hope, compassion, and knowledge that with my help (and hopefully yours) things will change. Have Yourself a Merry Little Christmas Now!